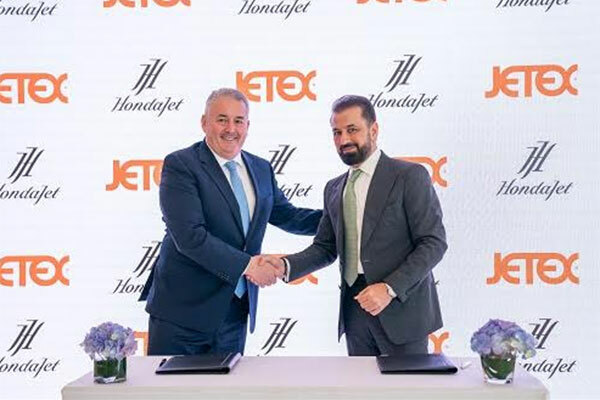 Jetex, a global leader in aviation services, is bringing the next-generation in advanced private jets to the Middle East after striking an agreement with Honda Aircraft Company to become the exclusive authorized dealer for the region. The deal means Jetex is now the manufacturer’s sole representative for the new HondaJet offering sales and support across the Gulf and Middle East region, a statement said. The official dealer signing ceremony between Jetex and the Honda Aircraft Company took place at the Jetex FBO Terminal Dubai, Al Maktoum International Airport, Dubai South on December 9. “With Honda’s brand strength and recognition in the Middle East, we have received tremendous interest in the HondaJet Elite. We are proud to appoint Jetex as HondaJet Middle East to provide our customers with a committed sales team in the region for the world’s most advanced very light jet,” said Honda Aircraft president and CEO Michimasa Fujino. The announcement follows the original appointment of authorized sales agent made in May at Palexpo during the 2018 European Business Aviation Convention and Exhibition (EBACE) in Geneva, Switzerland, where the HondaJet Elite was unveiled to the world. The aeroplane is a second generation aircraft in the private jet category and is the fastest, furthest and highest-flying plane in its class. The new plane boasts many technological advancements and innovations including a unique Over-The-Wing Engine Mount (OTWEM) configuration, composite fuselage and a Natural Laminar Flow (NLF) fuselage nose and wing. These improvements mean passengers can enjoy a largest cabin in its category as well as comfortable seating for up to seven people including a pilot. Other onboard facilities include a full service galley, private lavatory with optional belted seat and an exclusive Bongiovi sound system.